24" x 60", 4 Gauge Vinyl w/ Center Zipper and Side Gusset Elegant, high quality, translucent re-usable cover for bridal gowns and any type of formal wear. Preserves and protects garments. 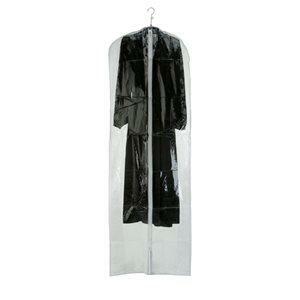 Also keeps clothing neat and wrinkle free and has reinforced hanger with center zipper. Printing available: Call our art department at extension 104 for easy set up for printing of your logo or we can custom design one for your store.Also, see printed vinyl bags category. Price per dozen.